The Kootenay Robusters began in early 2001, the brainchild of a Trail nurse and breast cancer survivor. After hearing about the 'Abreast in A Boat' teams, she and several other women whose lives had been touched by breast cancer decided to start a local team and so, with no dragon boat, no paddling experience, and the closest lake miles away, the Robusters team was formed. Women from the Kootenay communities of Trail, Castlegar, Rossland, Christina Lake and Grand Forks came together, with the initial goal of competing in Vancouver's dragon boat festival in June. Members included both breast cancer survivors and associate paddlers who joined to support the survivors. The women embarked on a strength and fitness program, and after leasing a dragon boat from the coast, began paddling in late May on Christina Lake. With just one month's training the team headed to Vancouver. In September the team raced in Kelowna, placing 2nd in the Breast Cancer Challenge race. 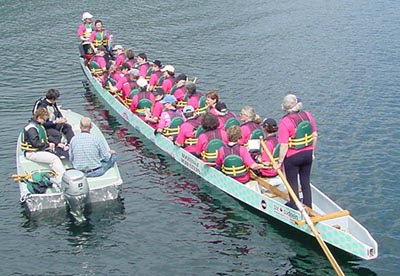 The association between breast cancer and dragon boats goes back to 1996. At that time it was widely held that repetitive upper body movements led to lymphedema, an irreversible swelling of the arm and chest that is a common complication of breast cancer. A Vancouver sports medicine physician, Dr. Don McKenzie decided to test this belief by conducting a medical study of 25 women, who began an exercise training program involving dragon boat paddling. The results of the study indicated that repetitive upper body exercise like paddling does not cause lymphedema, and the myth was laid to rest. 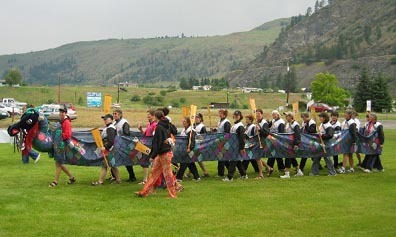 The first dragon boat team, 'Abreast In A Boat', has served as inspiration for teams not only in BC, but around the world. What began as a study has grown into a network of women who are increasing awareness of breast cancer, exploring their limits, building strength and physical fitness, and providing each other with emotional support and camaraderie. There are now more than fifty breast cancer survivor teams world-wide, competing at many Canadian and international dragon boat festivals while raising breast cancer awareness. The roots of dragon boat racing extend far back in time, and there are several legends surrounding its origin. One legend has it that in the fourth century BC a banished Chinese poet, Qu Yuan, drowned himself in the Mi Lo River to protest a corrupt government. With drums beating and paddles splashing, fishermen raced out in their boats in an unsuccessful attempt to rescue him. Other legends associate dragon boat racing with spring fertility rites to ensure bountiful crops. Regardless of the legend, dragon boat racing has a rich history, and has long been an important and colourful Chinese tradition.Many other countries have been captivated by the spectacle and pageantry of dragon boat racing, and festivals are now held throughout the world. Added to the cultural significance of dragon boat festivals is the thrill of competition, resulting in exciting events for spectators and participants alike.